There's a Reason We've Never Gone Back to the Moon! I feel I need to make the obligatory "in space, no one can hear you scream" reference, as that's what this poster is all about. Dimension Films has debuted a rather awesome new poster via Moviefone for the sci-fi thriller Apollo 18, directed by Gonzalo López-Gallego. They've finally got this set for a solid September 2nd release, and they put out a second official trailer a few months ago, so here's another poster as well. I want to see this just because I want to find out what the hell is going on, so I hope it lives up to the hype. Take a look below, as the image above is meant to deceive you! 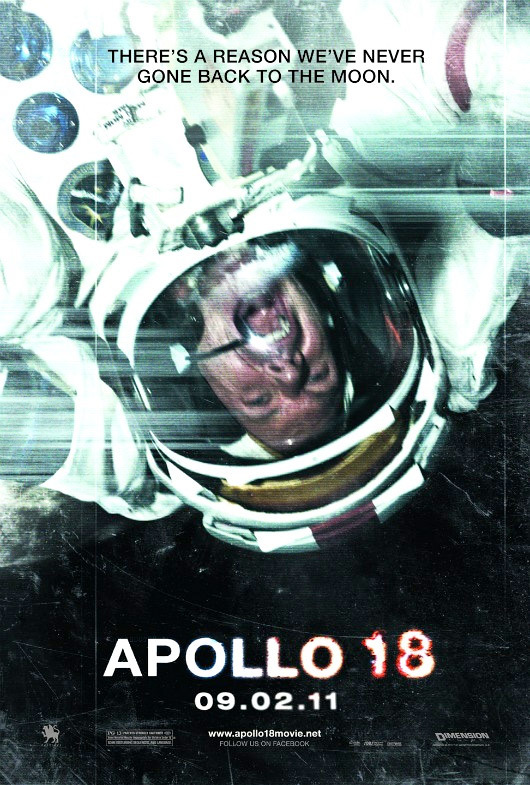 Here's the latest teaser poster for Apollo 18. We've also seen that footprints teaser and Russian poster, too. Decades-old found footage from NASA's abandoned Apollo 18 mission, where two astronauts were sent on a secret expedition, reveals the real reason the US has never returned to the moon. Watch the latest trailer. Apollo 18 is directed by Spanish editor/filmmaker Gonzalo López-Gallego, of a few features like King of the Hill and Nómadas previously, who is making his English-language debut with this. The original screenplay was written by Brian Miller (Paracusia) & Cory Goodman (Priest). Russian filmmaker Timur Bekmambetov also produced this in secrecy at Dimension Films. After delaying this for quite a while, The Weinstein Company is currently set to release the mysterious Apollo 18 in theaters starting September 2nd this fall. I'm amazed that no one else has anything good or bad to say about this poster? I think it's pretty awesome, especially for a sci-fi movie I'm quite interested in seeing. Looks so low budget. Look at font they used for the 'There's a Reason..." text. Who cares about the font, what about the picture itself? It looks good imo. The poster is cool, and I'm almost always a fan of the scratched and faded old-school look. I'm really curious to check this out, I just hope the found footage aspect actually works without seeming too ridiculous.